The effort to minimize the risk of contamination during lubricant handling and dispensing has been a recent priority at Sunoco Chemicals. The Frankford plant, located in Philadelphia, PA, manufactures phenol, acetone and alpha methyl styrene. It is the largest producer of these basic chemicals in North America and one of the largest in the world - operating almost 500 pumps and motors, a variety of gearboxes and a number of large air compressors. With production levels of 1.1 billion pounds (500 million kg) of phenol, 700 million pounds (300 million kg) of acetone and 70 million pounds ( 32 million kg) of alpha methyl styrene per year, downtime to resolve contamination control issues is not an option. A few years ago, the attitude at the plant was one that oil was just oil. If the oil level was low, new oil was added. 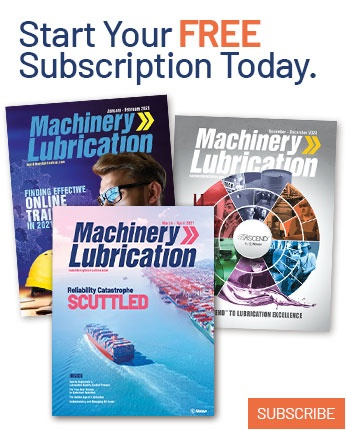 That attitude changed when people began to realize that lubrication practices have a marked influence on machinery reliability. About that time, one of Sunoco’s lubrication mechanics attended an oil analysis seminar and learned the importance of controlling lubricant cleanliness. With that realization, several changes relating to machinery lubrication, contamination control and oil analysis began taking place at Sunoco. Contamination is a leading cause of machinery failure by directly impairing the lubricant’s ability to control friction, wear and corrosion. With this awareness it became imperative to control contaminant ingression to avoid destruction to the lubricant (additives and base oil properties) and internal machinery surfaces. Once contamination was introduced, lubricants started to degrade and the equipment’s internal components, including critical frictional surfaces, deteriorated prematurely. By reducing contamination from its originating source, the life of the lubricant and machine can be greatly extended. Figure 1. Sunoco’s clean room has drip pans below barrels, hoses for easy access and clearly labeled containers. The initial review of Sunoco’s lubrication program revealed some disturbing facts about current practices. Oil was stored at a variety of locations throughout the plant. In fact, some of the oil was stored in areas containing large amounts of dust and debris. Other oil was stored in buildings with leaky roofs permitting rainwater to cover the tops of the oil drums every time it rained. Some oil containers were stored in an area where metal grinding, machining and welding were performed. In all instances, the new lubricant was contaminated before it left the shop. Further investigation found some oil drums with no cover at all, and in those cases, oil spills were a common problem. Other containers were used for more than one type of lubricant because proper identification was missing. One person would use the container to transport gear oil and another person would use the same container to transport hydraulic fluid. These problems caused several equipment failures, not to mention the money and time spent in repairs and downtime. After the initial review, the first step was to eliminate all open containers. An inventory of all lubricants quickly followed. Through the inventory control process, a variety of oils from a variety of manufacturers were identified. Oils that had been stored on-site for several years were unearthed. At this point, Sunoco began the search for a single lubricant supplier. Throughout the selection process, it was important that the supplier be one that provides high quality lubricants as well as packaging and transportation processes. Figure 2. These metal oil cans prevent some airborne contaminants from entering, but not all. They are difficult to label and present other contamination problems. 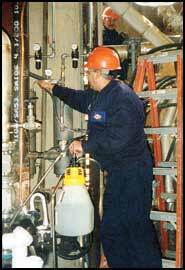 Once the lubricant supplier was selected, a clean room was prepared where all lubricants would be stored. 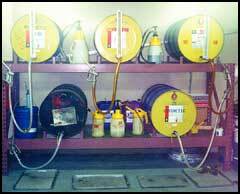 This is an area used to organize and store all lubricants away from dirt, dust, debris and water contamination. A drum rack was installed and all lubricant containers were color-coded for quick and easy identification (Figure 1). The plant’s machinery also needed to be updated. Most of the equipment did not have a proper breather filter, and for those that did, they had not been properly maintained. During the transformation to becoming a company aware of contamination, oil filtration became an important part of machine reliability. New oil filters and breather filters were installed and checked on a regular basis to ensure that they were working properly. Since then, the quality and health of the oil increased dramatically. It was obvious that the lubricant handling and dispensing procedures required change to keep contaminants from entering the equipment. The open metal containers Sunoco used to store and transport lubricants to the machines were at risk for contamination, and lacked proper labeling. Open containers create a high risk for spills and allow foreign particles such as dust, debris and water to easily contaminate the oil. The metallic containers caused a problem because of the potential for rust and lubricant degradation. Some metal containers had been painted, presenting the risk of contamination from paint chips. 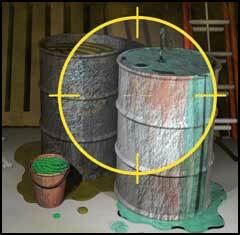 Also, painted containers are hard to label, creating additional problems with mixed lubricants (Figure 2). Figure 3. Charles Pitt at the Frankford plant demonstrates how containers are effective in ensuring that clean oil is introduced into machines. 3. How easy is it to keep clean. Sunoco selected nonreactive plastic containers that close tight. The containers were designed for the specific purpose of storage and transport of lubricants in-plant. They are built to last, have closeable dispensing nozzles, are easy to label, easy to clean and easy to store and carry. They are also available with attachable hand- pump lid. Once oil transportation containers were selected, contamination control during storage, handling and dispensing became much more cost-effective. These products save the plant time and money, prevent spills and waste, and improve lubricant procedures (Figure 3). 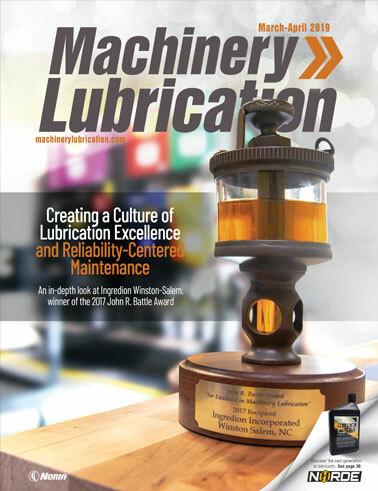 Sunoco Chemicals has reduced lube related failures by improving the cleanliness of oils introduced into machines and increasing productivity by reducing the oil refill time. A lubrication computer program is currently being installed as the next step toward reducing contaminate ingression. This program contains a comprehensive list of all plant equipment, the type of lubricant for each piece of equipment and historical data. It tracks time intervals for lubricants, oil filters and air filters. Like any good maintenance practice, the earlier a problem is detected, the less expensive it is to correct. It is a better practice to invest in ways to keep contamination out of equipment than removing the contamination after ingression. It has been said that the cost preventing the ingress of contamination may only be 10 percent of what it will eventually cost once the contamination is allowed to enter lubricating oils.